In a strange turn of events, Nvidia elected to use Epic Games’ media event (instead of its own last night) at the Game Developers Conference to reveal its newest flagship graphics card, the Titan X. The new card is based on the Maxwell architecture with a 12GB frame buffer and eight billion transistors. Unfortunately, Nvidia CEO Jen-Hsun Huang provided only a snippet of information on the card as to not spoil the company’s own technology conference in a couple of weeks. The executive autographed the card he unveiled, gave it to Epic Games founder Tim Sweeney and left. Sweeney said he will cherish the hardware and of course will see what it can do. Strange, eh? Given what little we know about the card at this point, it’s probably safe to assume it won’t come cheap. Nvidia announced its Titan Z graphics card a year ago at the staggering price point of $3,000 (you can build a complete high-end system for that kind of money, easily). 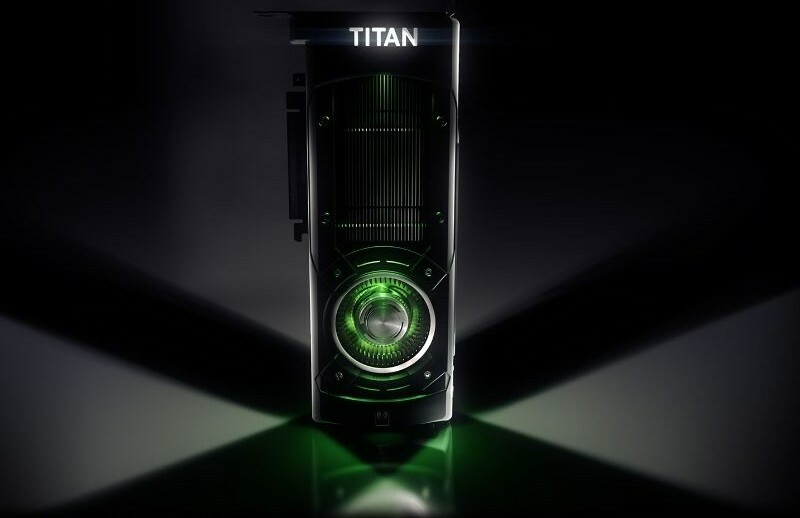 Before his speedy exit, Huang did say that the Titan X would power GDC 2015, so perhaps we may hear more about it in the coming days. Nvidia’s GPU Technology Conference is scheduled to take place on March 17 through the 20th in Silicon Valley. The opening keynote with Huang and Tesla CEO Elon Musk gets underway at 9 am. Soo... What are the chances of a 6GB "980Ti" variant? A bit like the 780Ti was to the Titan Black? If the rumor mill is to be believed, the price is going to be $1,349, Most people who buy this for gaming will have no use of the double precision floating point prowess of the card, and the few that would probably should have spent a couple hundred extra bucks to get a proper Quadro! I. Want. To. See. It. Run. 4K. By itself, and in SLi. And you can send me the sample when your done scorching it, just tell them one of you ate it. I don't know, $1.35k seems way too cheap for a Titan and I'm sure we'll see a sub $1k Ti version. By all accounts (and from Nvidia themselves) the GM 200's double precision will be in line with GM 204 (I.e. a miniscule 1:32, maybe 1:24), which is why Nvidia reworked GK 110 into the GK 210 with doubled cache and shader module register and enhanced double precision throughput. GK 210 was developed alongside Maxwell, so the decision to withdraw full (1:2 or 1:3) FP64 rate was made some time ago and was always destined just for pro graphics. If this is indeed the case, and I'm betting it is, I could see the principle drawcard for the Titan X being only the 12GB framebuffer (a definite plus for content creation/ rendering as opposed to shelling out for a K6000 Quadro) working at 8GHz effective. Nvidia may need to further differentiate the difference between the Titan X and a 980 Ti, which would mean either the latter is a salvage part (with maybe a full die/6GB 985Ti / 1080 to follow), or Nvidia allow a significantly higher board power limit for the top part. They could have shown this instead of the GRID and it would have been more interesting. Burty117, Filip B and dividebyzero like this. It's called ring'n run, cowardly nVidia. Perhaps if you remove the top cover, it'll say "GTX 980" underneath. Remove the CPU sink, there will be "GTX 780" below it. Remove that and you will see "GTX 280" stamped on the board. Remove all chips, there will be "ATI, made in China" somewhere. But hey, just couple grand for something that glows in the dark - I'm totally in! I'm looking at this Titan X and I'm just waiting to see how the AMD 390X will take its face easily.